Join the discussion on our forums! Come discuss High Priest Thekal over in our dedicated High Priest Thekal discussion topic. Battlecry: Convert all but 1 of your Hero's Health into Armor. "…and then I beat him with 1 Health!" if you could somehow give this lifesteal before it's battlecry went off do you think it'd heal you back after giving you the armor? No, because Thekal is not attacking you, his battlecry gets rid of your health and replaces it with armor. This guy not only has one but two infinity gauntlets. 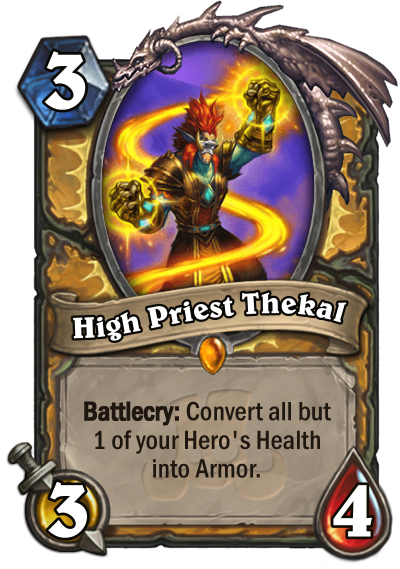 Wait how is he a priest if he's a paladin card? Because it's just a title. Priest and paladins are almost the same thing in wow lore. A nice addition to handbuff Paladin when you're playing massive Corpsetakers, Vicious Scalehides, and Wickerflame Burnbristle. Sorry, I knew this joke has already been made (shout-out to Arachnidius for providing the idea), but I couldn't resist. Will revisit after the whole set is out, but I'm extremely excited to hope that Midrange/Control Paladin might be a thing again. I guess this would be the optimal scenario. 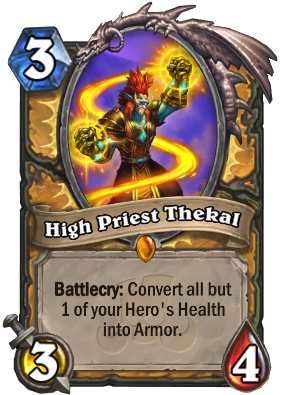 But by turn 10, I doubt you'd still have the 30HP to trade with High Priest Thekal. 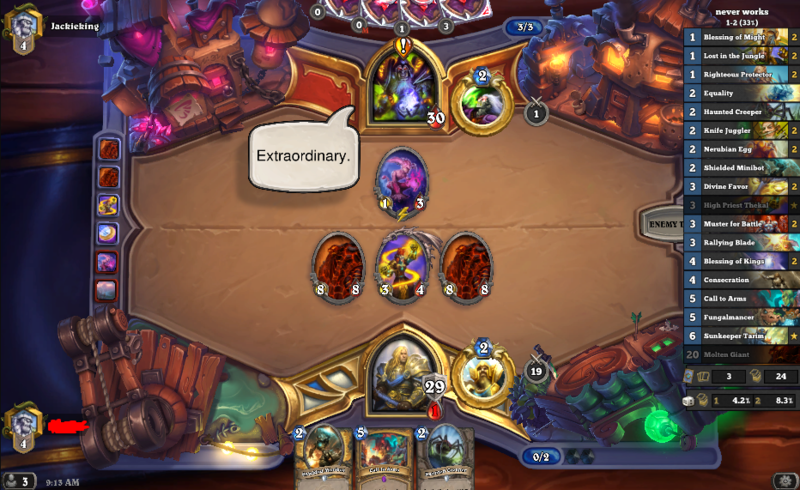 You could use Shirvallah, the Tiger + Crystalsmith Kangor, gain 14HP, play High Priest Thekal and then play the Faceless Manipulator for an additional 14HP. 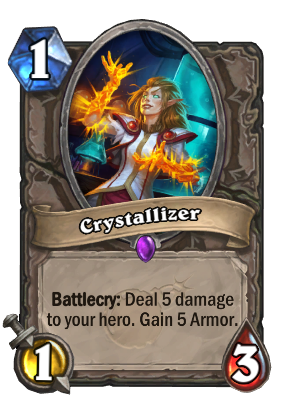 Can't wait for control paladin to return! > "Thank you!" "My master will return!" > "You are safe now." "The light shall burn you!" "You have bested me..."
You mean "I know it's a Paladin* card?"